The hydrochloride salt of a piperidine derivative with neurocognitive-enhancing activity. Donepezil (Aricept) reversibly inhibits acetylcholinesterase, thereby blocking the hydrolysis of the neurotransmitter acetylcholine and, consequently, increasing its activity. This agent may improve neurocognitive function in Alzheimer's disease, reduce sedation associated with opioid treatment of cancer pain, and improve neurocognitive function in patients who have received radiation therapy for primary brain tumors or brain metastases. Donepezil (Aricept) is the most prescribed Alzheimer's disease therapy worldwide. Donepezil, a medication that is approved to treat people with Alzheimer's disease, should not be prescribed for people with mild cognitive impairment without a genetic test. Evidence is mounting that drugs used to treat depression and Alzheimer's disease also can help patients recover from strokes. But there are conflicting findings from studies of these and other drugs given to recovering stroke patients. Axovant Sciences Ltd., a leading clinical-stage biopharmaceutical company focused on the treatment of dementia, today announced the first patients screened in MINDSET, a confirmatory global phase 3 study of Axovant's lead product candidate, RVT-101. Axovant also announced that the company and the U.S. Food and Drug Administration have agreed to a Special Protocol Assessment (SPA) supporting this phase 3 program. New research findings have fuelled hopes of a drug that can slow down the progression of Alzheimer’s disease. New warnings have been added to the prescribing information for the Alzheimer's drug Aricept (donepezil) advising of the risk of two rare but potentially serious conditions: muscle breakdown (rhabdomyolysis) and a neurological disorder called neuroleptic malignant syndrome (NMS). Actavis plc and Adamas Pharmaceuticals Inc. today announced that the U.S. Food and Drug Administration (FDA) has approved the New Drug Application (NDA) for Namzaric, a fixed-dose combination (FDC) of memantine hydrochloride extended-release, a NMDA receptor antagonist, and donepezil hydrochloride, an acetylcholinesterase inhibitor. OTC Markets Group Inc., operator of Open, Transparent and Connected financial marketplaces, today announced that Anavex Life Sciences Corp., a clinical-stage biopharmaceutical company developing novel drug candidates to treat Alzheimer's disease, other diseases of the central nervous system (CNS), and various types of cancer, has qualified to trade on OTCQX, the best marketplace for established, global and growth companies. Neuronetrix has been selected by Anavex Life Sciences Corp. to support the upcoming Phase 2a clinical trial for ANAVEX 2-73, a symptomatic and potentially disease-modifying treatment for Alzheimer's disease. Neuronetrix will be utilizing their COGNISION System to measure and analyze cognitive biomarkers in study participants. TWi Pharmaceuticals, Inc. today announced that it has received final approval from the United States Food and Drug Administration on its Abbreviated New Drug Application (ANDA) for Donepezil Hydrochloride Tablets USP, 23 mg, the generic equivalent to Eisai Inc.'s Aricept 23mg. Patients with mild to moderate Alzheimer's disease currently have no treatment options to slow brain cell deterioration. Researchers at Houston Methodist's Nantz National Alzheimer Center are studying an investigational drug that proposes to do just that. Eisai Co., Ltd. and Biogen Idec announced today that they have entered into a collaboration to develop and commercialize two of Eisai's clinical candidates for Alzheimer's disease (AD), E2609 and BAN2401. A drug developed by scientists at the Salk Institute for Biological Studies, known as J147, reverses memory deficits and slows Alzheimer's disease in aged mice following short-term treatment. Anavex Life Sciences Corp. ("Anavex") (OTCQB: AVXL) today announced that it has been invited to submit a full grant application to the Alzheimer's Drug Discovery Foundation ("ADDF") for a Phase 2a trial of ANAVEX 2-73. A team of scientists anchored at Yale University has demonstrated a new, highly versatile approach for quickly assembling drug-like compounds, establishing a broad new route to drug discovery and medical treatment. A research study conducted by Dr. Jesus Lovera, Assistant Professor of Neurology at LSU Health Sciences Center New Orleans, and colleagues has found that the herbal supplement Ginkgo biloba does not improve cognitive function in patients with Multiple Sclerosis (MS). 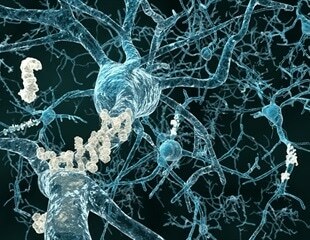 Researchers at Universitat Aut-noma de Barcelona (UAB), the Spanish National Research Council (CSIC) and the University of Barcelona (UB) have developed a multitarget molecule, ASS234, which according to the results of in vitro studies conducted, inhibits the aggregation of the --amyloid protein, involved in Alzheimer's disease. Eisai announced today that the company has amended the licensing agreement with Teikoku Pharma USA, Inc. (TPU), a subsidiary of Teikoku Seiyaku Co., Ltd., pertaining to exclusive overseas marketing rights for the Aricept patch (once weekly donepezil HCl transdermal system). According to new developments patients with advanced Alzheimer’s disease could benefit from drug treatment to slow its progression. Scientists have shown for the first time that drugs used to slow the disease in its early stages also work when the condition is advanced, greatly extending the population who could be treated.